If you're a trucker who wants to stay in the industry, brokering can be a viable alternative to driving. Trucking can be a rewarding career, but it may not be right for every life situation. If you're a trucker who wants to stay in the industry but not drive, freight brokering might be the answer. Licensed freight brokers may be companies or individuals, some of whom work out of their homes, that match up carriers with shippers for a fee. According to Transportation Training Solutions, a Texas-based freight brokerage training institution, there are 4,000 licensed transportation brokers in the US. Only 50 percent of them work full-time. With billions of tons of cargo moving through the nation every day, the trucking industry is growing. But trucking is a tough business, particularly if you're an independent owner/operator. And with hours-of-service rules, road congestion and increasing tolls, it's only getting tougher. John Thomas, a former accountant and founder of Atex Logistics, a freight-broker training program that includes on-the-phone coaching, says injuries, family needs, burnout and rising operating costs are the most frequently cited reasons that truck drivers hang up their keys. Thomas did extensive research by talking to shippers, brokers and truckers for months. "So many truckers are suffering with the high fuel prices and going out of business, so they're looking for an alternative," he says. "Freight brokering keeps them in the industry." Kristine Polfer, a trainee at Atex, co-runs a Florida flatbed trucking business and plans to start a freight-brokerage business. Polfer's trucking background "has already made a difference in [her] training," she says. 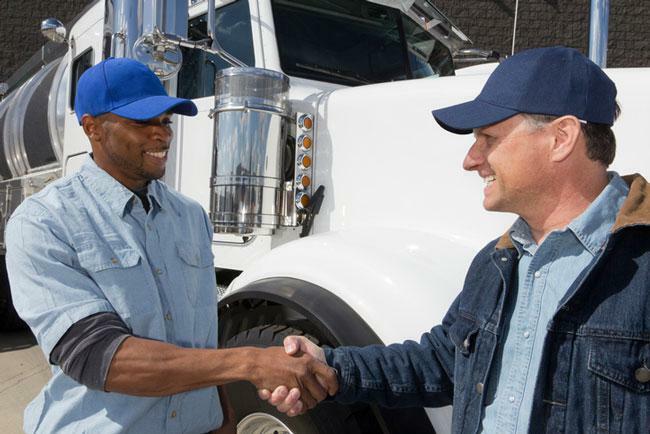 Moreover, having trucker associates, family members and friends can be useful, because they may become your clients and partners. Half the clients Thomas trains are former truckers. A freight broker has low startup costs and monthly overhead -- "a couple of phones, a fax, a computer and file cabinets, and you're in business," says Thomas. "[But] it's difficult. You may have to wait two years or more to make good money." You will need to obtain broker's authority from a financial institution. The fee is $300. You must obtain a surety bond or trust fund from a local bank or bonding company. Depending on your personal credit history, costs range from as little as $550 per year to a one-time fee of $10,000. This basically acts as your insurance policy for the loads you broker. You should pay a processing agent fee of $50. If a lawsuit is filed against you, a lawyer from the state you're being sued in will inform you of the claim. Training typically takes two months, but Thomas says the length of training depends on your time commitment. "I have a 90-page manual and 21 handouts that I email," he says. Then you get set up, have a business plan ready and start contacting shippers who use freight brokers. "We use boards where shippers and truckers can post loads," much like a matching service, he says. Persistence counts. "Once the load gets covered, the broker baby-sits it to its destination and pays the trucker within 21 days," Thomas says. "You want to pay on time so that the truckers will come back to you and you build repeat business." Transportation Training Solutions estimates potential profit for full-time brokers ranges from $40,000 to $150,000 a year. According to Thomas, a typical load may yield a $1,400 profit for the trucker and $140 for the broker. At five times a week, you can make $700 per week; at 25 times a week, $3,500. That gets easier to do if you build a regular client base. "It's nice to sit back and have a shipper call you," Thomas says. Learn more about logistics careers. Learn more about transportation careers.